British yachtsman Conrad Humphreys has taken to the stage to provide a remarkable behind the scenes account of how he and eight other men were able to complete a gruelling recreation of arguably the most remarkable survival story in maritime history. At the University of Plymouth’s Marine Institute spring public lecture, last night, Conrad revealed to an all-ticket audience how the 4,000 mile Pacific voyage, mirroring the path of Captain William Bligh’s boat in 1789, had been “an audacious and reckless trip” and one the greatest challenges of his professional career. Conrad, and eight companions – led by SAS: Who Dares Wins frontman, Anthony Middleton – endured sickness, injury and near-starvation in the course of filming the documentary, Mutiny, which was broadcast over five weeks by Channel 4. The 23-foot open keel-less boat, a replica of the one that Bligh and his men were cast adrift in following the mutiny on HMS Bounty, was also in attendance, stationed outside the Sherwell Building on the University campus. Entitled Mutiny: Recreating Captain Bligh's epic voyage of survival, the 60-minute lecture and Q&A enabled Conrad to share some of his personal reflections on the project and reveal how he had genuine concerns for the long-term safety of the crew due to the effects of dehydration. During the course of the 60-day sailing, the team were left with only traditional navigation equipment and had only the same meagre rations as Bligh, from the moment they set off from the start point, 35 miles to the south of the island of Tofua, near the Kingdom of Tonga. Conrad will now be sharing his experiences at two further lectures in London. 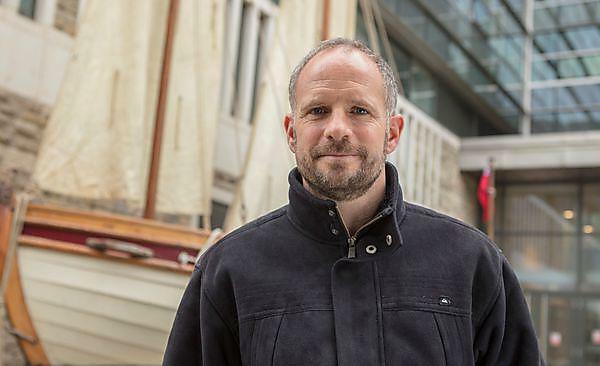 He is also working with the Island Trust to ensure that the boat is preserved and used for educational purposes, as part of their mission to provide life-changing sailing experiences for disadvantaged and disabled young people.